As The CW’s DCTV universe continues to grow with the addition of new characters joining The Flash, Supergirl, and Legends of Tomorrow, the show that kicked off this universe is making way for its seventh season. Arrow‘s sixth season concluded with Oliver Queen officially being outed as Star City’s Green Arrow, and subsequently being arrested and sent to prison. With the Green Arrow out of the game and vigilantism looked upon as a crime, it’s safe to say Star City will continue to remain the crime-ridden city it has always been. As for Oliver, it seems he won’t be entirely comfortable serving up his super max prison sentence as he shares cell blocks with those he has helped put away, including Bronze Tiger (Michael Jai White) and Danny Brickwell (Vinnie Jones). As usual, Warner Bros. didn’t shy away from showing off their television side at this year’s San Diego Comic Con, premiering brand new first look trailers for all of their CW DC series, as well as a first look at Titans premiering on the DC Universe app. Additionally, the upcoming inclusion of Batwoman was also teased, and may continue to remain on fans’ minds until this year’s inevitable CW crossover. 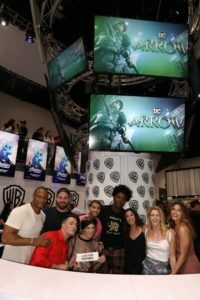 At San Diego Comic Con we were given the opportunity to chat it up with series stars Stephen Amell, Emily Bett Rickards, Echo Kellum, Rick Gonzalez, and Juliana Harkavy, who play Oliver Queen, Felicity Smoak, Curtis Holt, Rene Ramirez, and Dinah Drake, respectively, as well as series producers Beth Schwartz and James Bamford. While the cast and crew remained a bit tight-lipped about Batwoman’s eventual debut, they were able to shed some light on the themes and expectations of Arrow‘s seventh season. Writer/producer Beth Schwartz continued to push that the theme of redemption will play a major role, which has nearly always been an underlying theme since season one. The members of Team Arrow will all be in new places they weren’t in last season, and according to Schwartz they will all be “spread out, doing their own thing.” As far as the upcoming series crossover is concerned, Schwartz shared her excitement for the debut of Batwoman as well as her excitement collaborating with writers from the other CW series. Schwartz is also responsible for writing the upcoming episode in which Roy Harper (Colton Haynes) returns to the series, which she seems very content with, but suggests Roy and Thea’s situation may come with its share of emotion and tears. James Bamford, who is responsible for directing this season’s crossover episode and more, gives a positive outlook on the series’ new direction in season seven. According to Bamford, Schwartz has some “fantastic plans” on where the characters are headed and how new ones will come into play. Bamford also suggests that there will be more than one “big bad” this season, which has been an ongoing trend, especially since the series’ sixth season which began with Cayden James (Michael Emerson) and concluded with Ricardo Diaz (Kirk Acevedo). Rick Gonzalez, who plays Rene Ramirez, a.k.a. Wild Dog, didn’t shy away from touching on themes of redemption in terms of where his character has headed and is heading. Gonzalez states every decision Ramirez makes is made with the idea of self-improvement in mind. He hopes to have more screen time devoted to the father-daughter relationship between Rene and Zoe (Eliza Faria), and cites Hugh Jackman in Logan as a character Wild Dog can identify with as both are hardened heroes with soft sides in terms of their daughters, or in Logan’s case, cloned daughter. As Bamford suggested previously, Juliana Harvaky, who plays Dinah Drake, a.k.a. Black Canary, suggests that Arrow‘s seventh season is going in new directions and has a different feel thanks to Schwartz serving as showrunner. Harvaky states her “jaw was on the floor” just within reading the first paragraph of the script for the season premiere. Harvaky hopes to see more of Dinah Drake’s backstory play out on screen, and states that the relationship between Dinah and Black Siren will remain complicated, though her character is “looking at things differently,” so that the vengeance she was so set on last season may be a thing of the past. Black Siren, played by Katie Cassidy, although from an alternate universe, will continue to play the role of Earth-1’s Laurel Lance. Echo Kellum and Emily Bett Rickards didn’t share much with us in regards to the seventh season’s new direction, or any specifics regarding to Curtis and Felicity’s current states. They did, however, suggest that their respective romantic relationships won’t be front and center as they have been in the previous season. Obviously, since Oliver is currently residing in a super max prison, there isn’t much of an opportunity for Felicity and Oliver to get together. As for Curtis, although Kellum doesn’t suggest his new relationship with former Star City police officer Nick Anastas (Evan Roderick) is over, he does imply it won’t be in the forefront. Last, but certainly not least, we spoke with the star of the series, Stephen Amell, alongside producer Beth Schwartz. Amell stresses the permanence of Oliver’s prison sentence, suggesting that for the time being Oliver is stuck there and has little communication or connection to the outside world. One interesting thing Amell points out is that Oliver will seem to be the opposite of a hero while serving his sentence, at least in the season premiere, to the point where Amell hopes the premiere makes fans of the character “mad.” As the season premiere kicks off with a lack of vigilantes in Star City, Amell says the question is asked on whether or not Oliver did make the right decision in outing himself and going to prison. Like the rest of the cast and crew, Amell didn’t speak much on the debut of Batwoman, but states he’s more excited about Oliver’s interaction with another character during the upcoming crossover. Arrow‘s seventh season is set to premiere on The CW on October 15th. The CW’s DC crossover, which will serve as a four-part event crossing over Arrow, The Flash, Legends of Tomorrow, and Supergirl, will air in December. Check out the official trailer for Arrow‘s seventh season below, as well as an SDCC sizzle reel teasing the debut of Batwoman into the Arrowverse, and feel free to let us know what you think in the comments.